SteelSeries has risen as a prominent force in gaming accessories, whether it be mice, keyboards, or headsets. We recently reviewed the SteelSeries Arctis 5 headset and ended up hailing it as the best gaming headset under $100. Now, we’re taking a look at an even more inexpensive headset — the SteelSeries Arctis 3, which comes in at only around $80. $80, however, is still a good chunk of change. Does the headset live up to the SteelSeries name? We put the SteelSeries Arctis 3 headset to the test to find out. After reviewing the Arctis 5, we were struck by how similar the Arctis 3 headset was — and that’s a good thing. The headphones are sleek and stylish, and while pretty big they weren’t overly heavy, which plays well for comfort. The headphones come in a range of different colors. We’re reviewing the blue pair, though they also come in black, white, red, and gray. You can also choose from a range of headband styles, which get pretty interesting. Unlike the more expensive Arctis 5, the SteelSeries Arctis 3 does not have light up ear cups, and while that feature is cool it makes sense as a way to cut costs a little. Like the Arctis 5, on the left ear cup you’ll find audio inputs, a volume wheel, and a microphone mute button. The microphone pulls out from the ear cup and can be simply pushed back in, which we really liked — it means you don’t have to worry about carrying a detachable microphone around and it’ll always be there when you need it. The headset adjusts to your headset with an elastic band, and that works quite well. What it means is that you can adjust the headset when you first get it, then leave it be — it’ll fit perfectly well every time. We really liked that in the Arctis 5, so it was nice to see it again for the Arctis 3. In the box, apart from the headphones, you’ll find a few audio cables (including a dual breakout cable for the headset and microphone) and that’s about it. You probably don’t really need much more than that, but a carry case or bag is always welcome. SteelSeries generally makes some of the most comfortable headsets on the market, and the Arctis 3 is no exception. We found it to be about as comfortable as the Arctis 5, and thats thanks largely to the great elastic headband design. The headset is pretty light compared to most other headphones, and we were able to wear them for hours on end without them getting uncomfortable. Like the Arctis 5 the clamp on the headset could be slightly tighter, which would have created a slightly better seal, but in the end that was far from a deal-breaker. Apart from that, the SteelSeries Arctis 3 offers plenty of padding in the ear cups. So how does the SteelSeries Arctis 3 sound? Well, for the price that they come at, they sound pretty great. The bass is relatively deep and powerful, which is great news for gamers who want to experience slightly boomier explosions and a bit more grunt in a car’s engine. The bass could have extended a little deeper than it did, but it still performed pretty well. The mid range was pretty well-tuned too. There were plenty of low-mids to help give the headphones a nice warmth, and enough high-mids to ensure that things like your teammates’ voices cut through the sound effects and music. The high-end could have been a little clearer and more defined, but there were enough frequencies there to ensure things like gunshots had plenty of sizzle. Perhaps the best thing about the headphones is that they sound is customizable through the SteelSeries Engine 3 software, which works best on a PC. 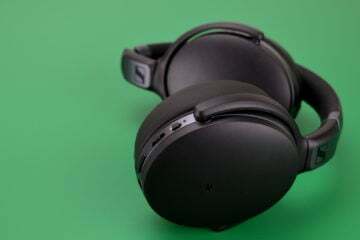 You can both customize the EQ, and the surround sound — that’s right, these $80 headphones indeed offer 7.1 surround sound, which is a pretty big deal. It will take some tweaking to find the best settings for each game, but if you’re comfortable doing that you can get a pretty great sound. Of course, keep in mind that you will have to register the headset to do so — because the headset connects through the 3.5mm jack rather than through USB. From our tests, it seemed like the headphones were able to perform across all gaming genres — we couldn’t find a genre in which the headphones sounded bad. Like most other gaming headsets we test, the microphone on these was pretty good but perhaps only for in-game chat. If you’re wanting to record podcasts or Let’s Play videos, you’ll still want a dedicated microphone. That’s not to say the microphone sounds bad — just that it’s not the best. Surprise, surprise. SteelSeries has produced yet another awesome headset in the SteelSeries Arctis 3. Now, the Arctis 5 is a better headset overall — it’s got some cooler design elements, a music/chat on-desk dial, and so on. But for $80, the Arctis 3 is still an excellent option, and definitely the option you should go for if you want to save a few bucks and don’t care about the things that the Arctis 5 has over this headset. Of course, if you want to save even more money there are still some great options. The HyperX Cloud Stinger comes in at $50, and while it doesn’t have the 7.1 surround sound, it may still be the best option for some. Because of its great design, top-level comfort, and good sound quality, we’re awarding the SteelSeries Arctis 3 gaming headset the Headphone Review Silver Medal. I have just bought these. Straight away I feel disappointed with this item. Comparing to my Hyperx cloud 2 these come nowhere close to that comfort level. I find the Arctis 3 very tight and a relief when taking them off. I can feel my ears touching the inside of the cup area where the speaker lining is. You can hear outside noise quite easily, so takes away from that immersive quality that you want in games. Also the volume control wheel on the side of the ear cup is very poor quality. When off then rolling slowly to increase the volume, you can hear the sound starting up in one ear, then it transfers to the other ear, then they both come on. Turn it a bit more and bang! The volume just jumps up to a loudness that may surprise you if your system levels are already on high. So warning!! Adjust down your system sound level before trying the Arctis 3. Bloody hurt my ears. I had been wearing the Arctis 3 whilst typing here and just HAD to take them off. I couldn’t take it any longer. My head hurts, and I don’t have a wide shaped head. So god help those that do. It’s not the inner strap either. I had it loose. It’s the outer plastic band that pulls into your head tightly and its quite strong. I have tried the sound on two FPS and have not noticed any surround sound at all. I haven’t tried anything else, I don’t have that joy joy feeling of, “WoW!! I want to try listening to something else, these are awesome”! Nope. I still don’t have it. All software installed and setup correctly. Spent an hour getting it all done. Changing this or that. In comparison to the Hyperx Cloud 2, the sound is much clearer/ crisper on the Arctis 3 which was something I didn’t like with the Hyperx. There is a muddiness to the Hypers sound sound. Overall, for myself, If I could return the Arctis 3, I would immediately. If you cannot wear them because they hurt, then there is no point in keeping them. Sorely disappointed especially after reading all the raves from all these review sites on how fantastically comfortable they are. Not even close. No wear near being comfortable.